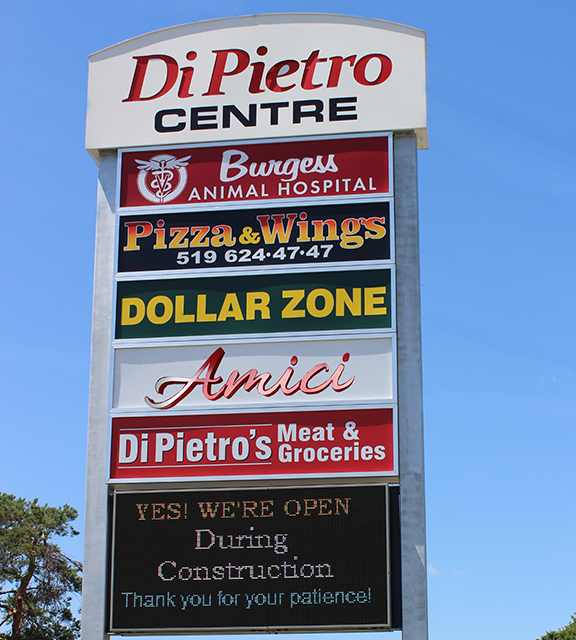 DiPietro's have been the Meat People for over three decades...and now, they begin their biggest expansion ever. If you love meat, then, of course, you'll love DiPietro's. For more than 33 years this unique local meat and European grocery destination has been catering to those who like to eat well and save money. One of their biggest draws is MEAT the way Meat Lover's really want it. Bruno DiPietro and his nephew Peter DiPietro have been putting in long hours for three decades refining a model which has brought them great success. "It hasn't been easy slugging it out with the big boys," says Bruno..."The margins are tight and it requires long hours because we do it all." Doing it "all" is how they compete ...and their customer base comes from as far away as the GTA to get what they're selling. This November, it will be three years since they bought the entire plaza. Then last year they knocked out the wall and expanded the bakery and the deli area to ready them for phase 2. Certainly, in the beginning, a good number of customers were Portuguese, and Cambridge is home to thousands of Portugal Proud People. But today, many cultures share the DiPietro experience. For the meat lover it's really easy to see why DiPietro's is paradise. The 84 foot fresh meat counter gives the broad spectrum of hand butchered meat. Beef, pork, veal, lamb, goat, rabbit. Then, in the deli, there is another 48 feet of smoked, meat products, and cheeses. DiPietro's is, quite simply, the biggest independant butcher and grocery store in the entire region. And, if you want to buy a whole pig to roast or BBQ, they will order it for you, OR if you want a whole roasted pig, DiPietro's can prepare it for you up to 100 pound carcass. Phase 2 began this past week and will see the store facility grow from 19,000 to 27,000 square feet. Almost every area will see growth: Produce, bulk, grocery and made-in-store specialty items such as Lasagne, Shepherd's Pie, homemade meatballs, sauce and more to come. A new area will be the hot prepared foods station for a variety of ready-to-eat side dishes and take home entrees. The seafood section will grow as well. Portuguese people love their seafood...but so do many cultures. Phase 2 should be completed for the holiday season, but the entire DiPietro Plaza will have an attractive new look and make over. The facade on the rest of the plaza will be completed next spring in time for the opening of the expanded garden centre. The DiPietro's apologize for the inconvenience of the construction but are really excited about the expanded changes because it will help serve their loyal customers even better. Presently, the new entrance is to the right of where the entrance was. A ramp has been installed there for those with mobility challenges. Below view the proposed designs for the new front entrance and other building street faces. In photo (Left) is Peter DiPietro beside his uncle Bruno DiPietro. Three years ago, the Dipietro's liked their Glamis store location so much...They bought the plaza. With growth for additional tenants it will become an even greater destination for local shoppers ...AND, of course, it will create new options and opportunities for all the "Meat Lovers" in the Tri-city area and well beyond.